Highly sophisticated, mathematically calculated design together with numerically controlled machines to acheive unparalleled curve accuracy. 10x more accurate than conventional lens designs. Personalized progressive lens with panoramic clarity in the distance zone. Offers a panoramic far visual field with freedom for lateral movements of the eyes. At both sides of the pupil position we find wide and clear visual zones for improved outdoor experience. Wearers will take advantage of a stable near visual area allowing all activities at this distance. A/R coating eliminates reflections & improves acuity. Comfortable even in extremely wrapped frames. 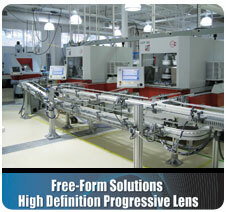 Ideal as a daily all-purpose progressive lens. Ideal solution for users with demanding requirements for large visual fields at any distance. Assured clear vision and best quality. Provides stable and generous areas for distance and near vision. Smooth gradation of power, gentle binocular balance design. Special parameter measurements are not required. Manufactured using the most advanced technology with the progressive surface cut on the back, rather than the front side. With the Intellect II HD Free-Form™ lens you will provide your patients the most Advanced Technology in high definition and digitally contoured back-side progressive lenses, giving patients the best possible progressive lens design available in today’s market.